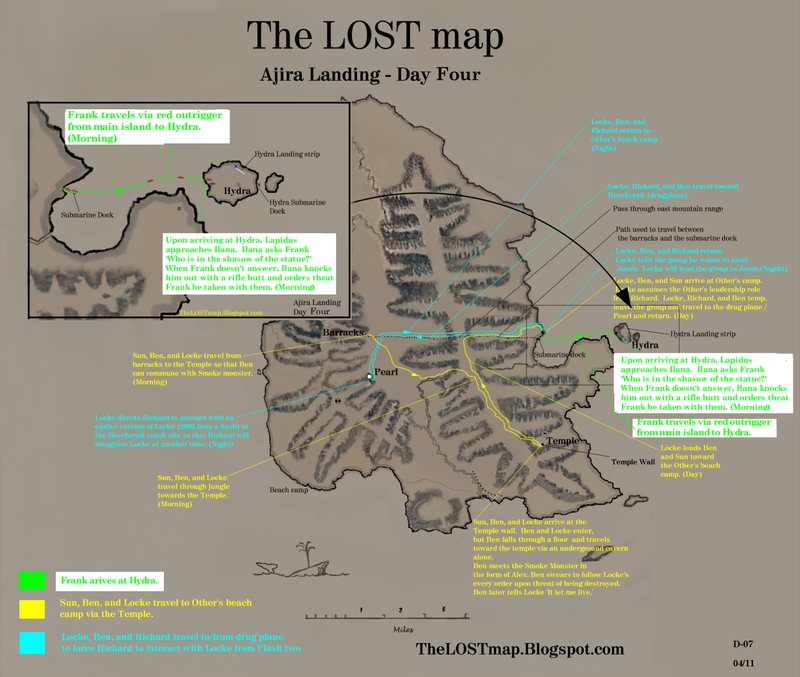 Main Island Jungle - (Morning) Ben, Sun, and Locke travel to the temple. They approach the wall around our temple (per Ben). Ben- ‘The temple is about ½ mile from here. They built the wall to keep people like the two of you from ever seeing it’ Ben and Locke go under the temple, while Sun waits outside. 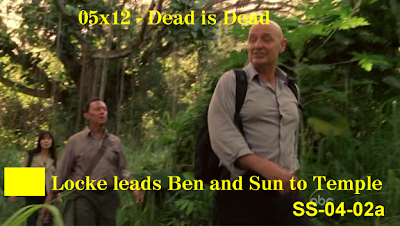 Before Ben and Locke go beneath the temple, Ben asks Sun that if she ever gets off the island, tell Desmond he is sorry. Hydra- (Morning) Lapidus arrive back at Hydra via boat. A 316 passenger tells him that the group has guns and are in charge now (Ilana and three passengers). Lapidus approaches Ilana at a large crate. Ilana asks ‘What lies in the shadow of the statue?’ Lapidus does not the answer and then Ilana knocks Lapidus out with a gun. Ilana tells one of her conspirators to take Lapidus with them. 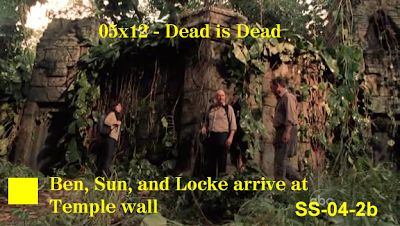 Temple- (Day) John Locke and Ben Linus go beneath the Temple. Ben tells Locke that when Keamy arrived all he had to do was walk out of his barrack and Alex would have lived. Locke tells Ben that Ben is correct, he did kill Alex, and will have to answer for that. 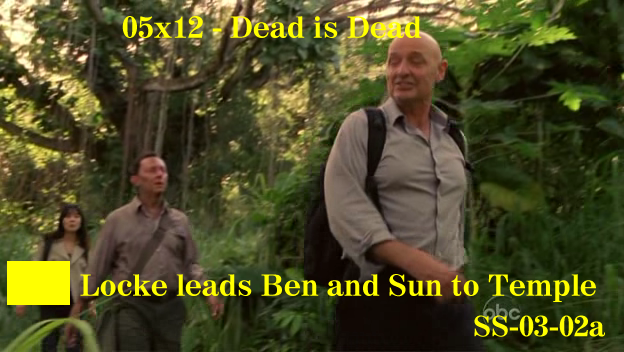 Locke leaves Ben, as Ben must travel alone to the Temple. As Ben walks forward the floor gives way and Ben falls approximately 10 feet onto a sub floor. 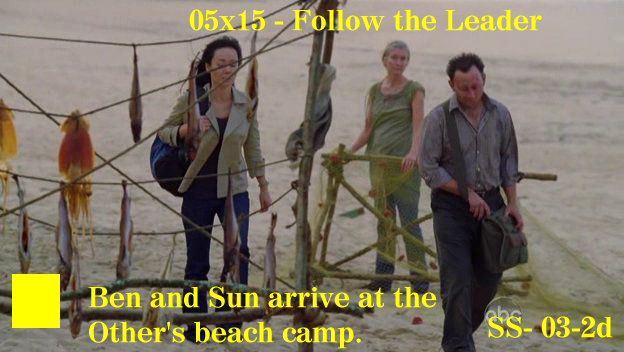 Ben then moves alone forward to an alter. Ben’s torch blows out. Monster sounds begin and smoke appears out of a perforated grate. The smoke monster envelops Ben. Ben sees/hears memories of him with Alex as she grew up and interacted with him. The smoke monster retreats into the grate, and Ben’s torch is relit. Other’s Beach Tent Camp- (Day) Richard is building a ship in a bottle. Woman (other) approaches Richard and says, “Richard, he’s here” (Richard and woman don’t use Locke’s name, it’s understood). Locke approaches the camp with a fresh killed boar for food. Locke is wearing a backpack. Richard – “It’s been three years”. Richard notices something different about Locke. Sun and Ben follow Locke in joining the camp. Richard asks Locke – “Why is he (Ben) here?” Locke-“Ben helped me get back”. 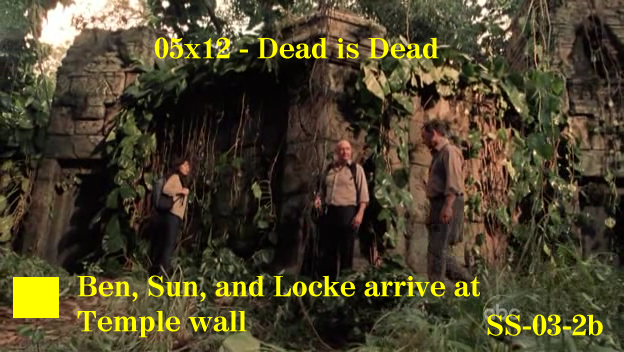 Ben explains to Sun that Locke is the leader of the Others now. Ben also tells Sun that Richard is a kind of advisor. He has had that job for a very, very long time. Sun shows Richard the photo of Jin, Hugo, Jack, and Kate from 1977. Richard tells Sun he watched them all die 30 years ago. Locke promises Sun that if there’s a way for you and Jin to be together again, if there’s a way to save our people, I’ll find it. Main Island - Jungle– (Night) Ben, Locke, and Richard are traveling toward the beechcraft. Richard does not understand how Locke disappeared. They travel to the beechcraft (flew out of Nigeria and crashed on island) Locke tells Richard what he will have to do during Locke’s experience during flash two and gives Richard a first aid kit out of his backpack. 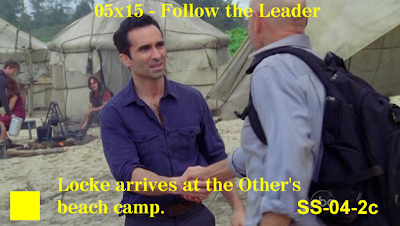 Locke makes sure that Richard tells Locke that he must bring everyone back to the island. When he asks how to do that he’s going to have to die. 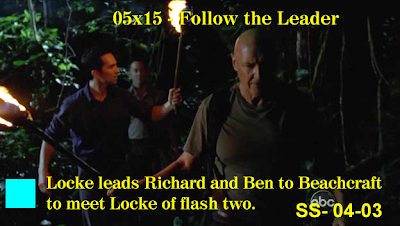 Locke tells Ben the island told hem the exact time the flash would show up. 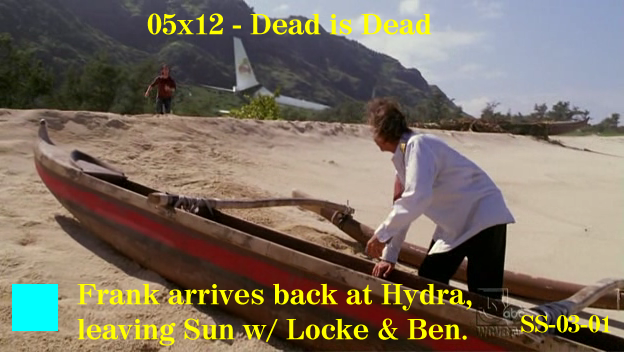 Ben admits to Locke the island never told him anything. Locke tells Ben that Ben has never seen Jacob. 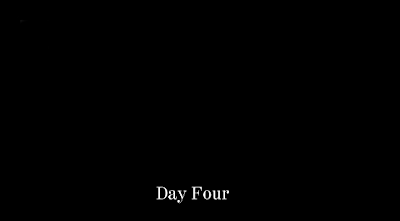 Locke disappears. Ben asks where he went. 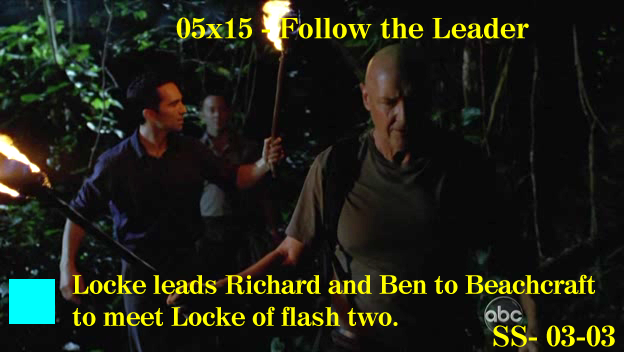 Locke tells Ben he went (disappeared) to give Richard his compass back. Richard keeps the bullet he took out of Locke’s leg. Richard tells Locke he did what was asked of him, even telling Locke that he would have to die. Richard says he’s glad that didn’t happen. 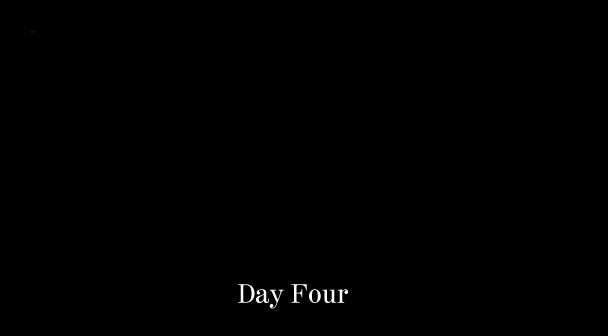 Locke tells Richard he did die. Richard does not understand. Other’s beach camp- (Night) Richard Alpart tells Locke some Others are at the temple, but the rest of them are at the camp. Locke speaks to the camp members and tells them he wants to meet Jacob and wants them to go along. 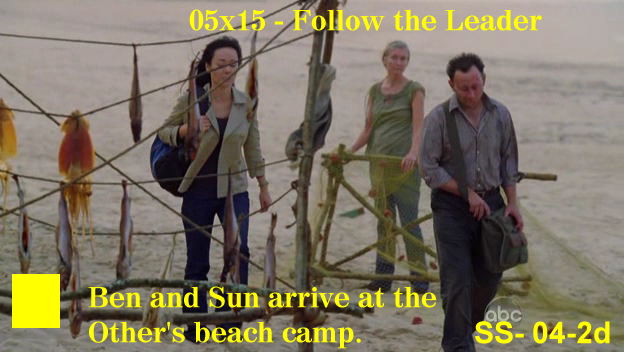 Locke tells Sun that Jacob can tell them how to bring Jin and the rest of the people back here.